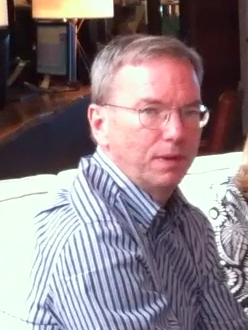 Today at the Techonomy conference in Lake Tahoe, CA, Google CEO Eric Schmidt sat down with a group of reporters after his panel to answer questions. A lot of questions. 45 minutes worth of questions. That included the death of Wave and the success of Android. But one area that a lot of people are interested in right now as it relates to Google is their overall social strategy — and what their thoughts are on social gaming. When asked about Google’s social intentions going forward, Schmidt noted that “there have been a whole bunch of leaks. Some have been correct, some not correct.” This is an obvious reference to the rumored Google Me project, and perhaps to Google’s investment in social gaming company Zynga. Both of which appear to be very correct. Schmidt went on to say that Google has always believed that their products would be better with more social signals. That said, he thinks the media is obsessed with “Facebook versus Google.” Schmidt elaborated: “We’re not trying to do what Facebook does.” “The world does not need another Facebook,” he continued. This echoes his comments from last week. When I asked specifically for a comment about Google buying social app maker Slide and investing in Zynga, as expected, Schmidt declined to comment. But he did offer up some of his general thoughts about social gaming. Such a statement seems to go against Google’s recent maneuvers. But you never know. Watch him talk about it in the video below.